It has four memory setting for different hearing environments ( Normal, Noisy, Treble and Power). The device is so small that some users may find the battery difficult to change if they have hand weakness or reduced dexterity. It is one of the newer amplifiers to hit the market. It was released in the summer of 2016 it is a direct competitor to the wildly popular Empower (formerly Lifeear). 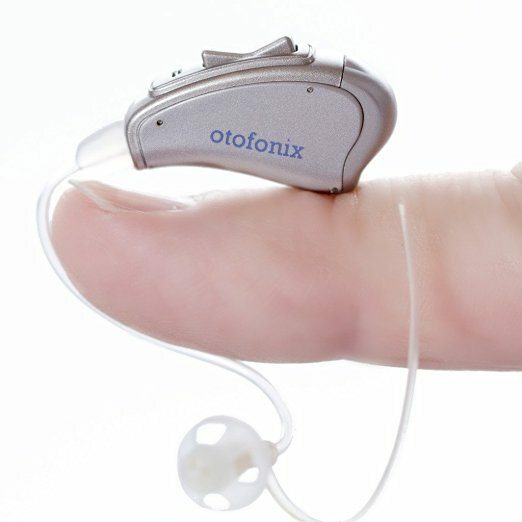 The Otofonix Digital Hearing Amplifier uses patented state-of-the-art digital processing that seems to be on par with its similarity priced competitors. There is only one switch to operate the amplifier, so it is straightforward to use, as well as allowing for some customization to help you get the right sound for you. It has a one-year factory warranty, and 45-day money back guarantee so you can test it out and if it isn’t right for you it is easy to return. The Otofonix Personal Sound Amplifier is one option if you are looking for a behind-the-ear amplifier in the $300 to $400 price range. It is excellent for individuals who want a simple easy to use device that offers some of the more advanced technology that you won’t find on cheaper devices. It has background noise reduction and feedback cancellation that helps to deliver excellent sound quality. It is also tiny and has a comfortable fit for most users. Otofonix is based in Huntersville NC, USA, but the amplifiers are manufactured in China (as most are). The company was founded by a retired Board-Certified Otolaryngologist (ENT Physician) who helped design this amplifier along with the help of other hearing specialist and audiologists. Most users seem to agree that the Otofonix is a comfortable device. It comes preassembled with the most popular size sound tube and a medium-size ear dome. In total it comes with two sound tubes and three ear domes (small, medium and large) to ensure you can get a comfortable fit for your size of ear. The small size of the device, as well as the small size of the sound tube, adds a great deal to just how comfortable this amplifier is to wear. As with other devices, it will take some time to adjust to the settings, especially if you haven’t worn an amplifier in the past. The Otofonix Personal Sound Amplifier devices come with a 45-Day free return policy. To return the item, you need to contact the company, and they will give you a Return Merchandise Authorization (RMA), and also tell you exactly how to return it. The amplifier comes with a 1-year factory warranty against defects in materials and workmanship. If it stops working due to parts, material or workmanship the company will repair or replace it for free (if they inspect it and agree that it isn`t working because of one of those reasons). The manufacturer also offers a Protection Plan in case you are worried about unexpected or accidental damage. 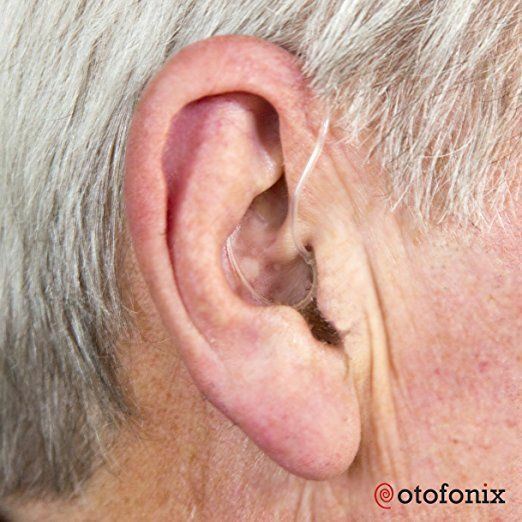 The Otofonix Elite takes a size 312 zinc air hearing aid battery that can be purchased at places like Costco, Walmart or online on Amazon. The batteries can last about 7 to 10 days depending on how much the amplifier is used. The company recommends that you open the battery compartment door when you go to bed at night to help conserve the battery life. Noisy setting – You use this setting when you need to reduce background noise, great for a restaurant or a mall. Treble setting – If you find that you are getting feedback or any high pitched sound you would switch it to the treble setting. Power setting – Has a higher volume than the standard setting, this is a good setting for watching TV. The Otofonix Personal Sound Amplifier color options are cream beige and pearl grey. You must buy either a left or right ear version if you can only afford one ear experts recommend that you buy for the ear that you hear best from. These devices are intended for moderate hearing loss, not severe hearing loss.